Can 2 Factor Authentication Be Used for a Family Sharing an Amazon Prime Account? The Upcoming 4th of July Means that Amazon’s Prime Days Will Soon Be Here too! What better way is there to celebrate our country’s most patriotic holiday than by saving a bundle in a family shopping spree on Amazon. Oh…and by upgrading your family’s Prime account to use 2 Factor Authentication. In this day and age using 2 Factor Authentication is almost a must for keeping important accounts and data secure. Seriously, if your family’s like mine…what could be more important than your Amazon Prime account? If you do have Amazon Prime, its more than likely that you share all your amazing Prime account benefits with your immediate family members…meaning your spouse and your kids. With all of Amazon’s cool new IoT technology like Amazon Echo, Echo Dot, Echo Tap, Echo Show and the soon to launch Echo Look…keeping your Amazon account secure was never more important than it is today. Not only that but Amazon now partners with other retailers…allowing customers to buy from infrequently visited sites using their Amazon account. With your credit card tied to all those things…it just makes good sense to begin employing 2Fa (aka 2 Factor Authentication) too. It seems like horrible viruses and ransomware are now a weekly occurrence. So protecting your family’s data and identity has never been more challenging yet never more important. Which is why, 2 Factor Authentication should almost be considered a God Given right…or the American Way. If you’re not familiar with what 2 Factor Authentication is and why it’s so important you can visit PC Magazine’s site to read their amazingly thorough article and learn more about it. What to Do if Your Whole Family Share’s Your Amazon Prime Account & You Want 2 Factor Authentication? Most 2 step authentication methods rely on sending an authentication code to either an Authentication app, like Google Authenticator or to a cellphone number in the form of a text message. I think you’ll immediately begin to recognize the problem with the SMS alternative. Family members usually don’t share one cellphone and cell phone number. Yet, the authentication process usually only lets you designate that one cell phone number is the recipient of the verification codes. The obvious work around is using an Authentication app instead. This can be a great solution for situations where you don’t have cell phone service or your cell phone isn’t always accessible or handy to get to. But here too, Google Authenticator only has a procedure in place for using their app on one device. There are workarounds for this situation published online. Several people have figured out an alternative to sort of hack Google Authenticator by scanning the QR code that’s sent very quickly onto multiple devices. If done correctly, you can add Google Authenticator to multiple devices. But this can only be done once when the original setup occurs. I discovered today that Google Authenticator isn’t the only authenticating app in the industry any more. There are others. Some which have become quite popular. The one I discovered today is a fierce competitor to Google Authenticator. Fierce, because like Google A…their service also is free. But they’ve managed to solve what turns out to be an incredibly complex problem with the multiple device multiple user scenario that’s my topic for discussion today. Authy may be the best solution to this problem. 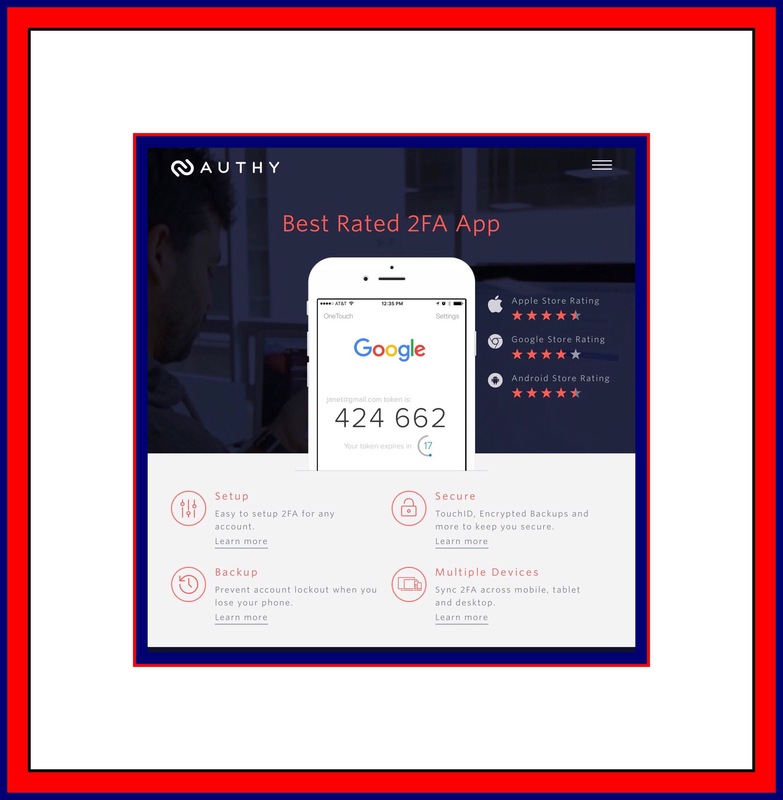 Authy is a free mobile / desktop app for two factor authentication, as well as security partner and SMS delivery service of many websites that want to make two-factor authentication work better for their users. I’m going to be switching our Amazon account to 2 Factor in a couple of days. Please read my article, checkout Authy’s website and ask me any questions beforehand to alleviate any unforeseen difficulties before Prime Days is upon us. Your data can be backed up to Authy’s server if your phone is lost or stolen – and afterwards, you can log out the old phone, too (settings: remove device). You will receive a push notification if someone else is trying to access your account via SMS. High risk accounts (such as Bitcoin) will require a 24 hour delay with email approval, or you can turn on this protection by disabling “multi-device” in the Authy app settings. You may sync multiple devices to one account – even copy and paste a token right from the desktop Authy app into the website you need to access. If you are traveling, the app doesn’t need an SMS with roaming charges… just use the code generated in the app. 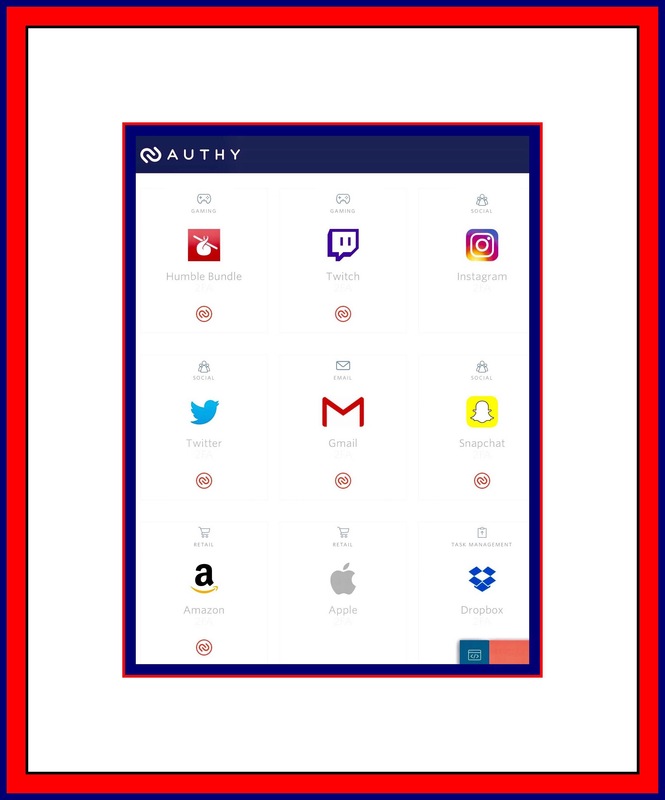 If you have changed your phone number but didn’t update your information with the websites you need access to, you may use Authy’s account recovery tools to change your number. First you’ll need to check with the website that you need an Authenticator app for to see if Authy will work for them. There’s very good chance that it will because most sites do. Next you’ll need to download the Authy app. Or if you want to really streamline the process you can visit their combined cellphone # entry and download page here. 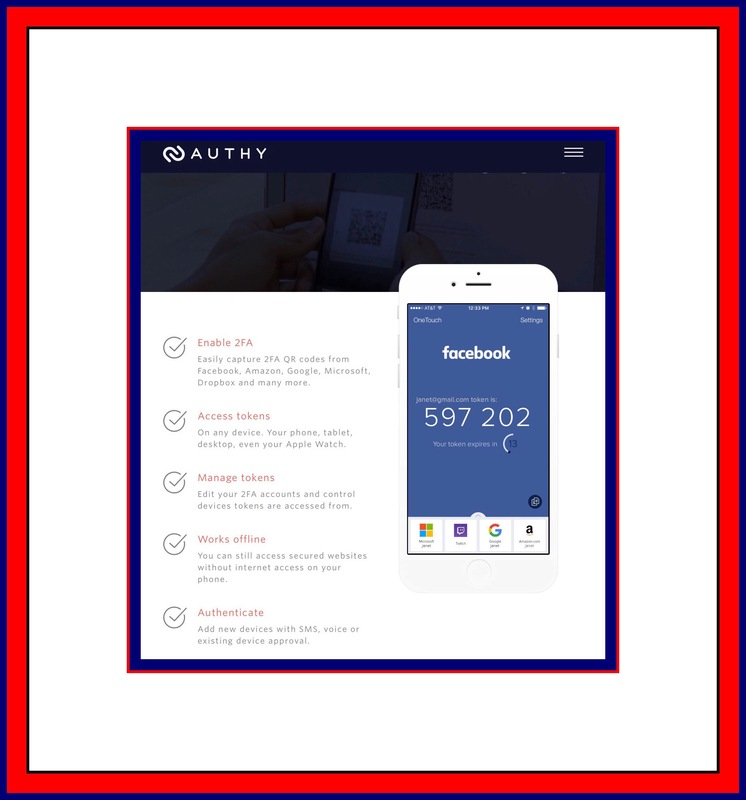 Authy is available for ios, Android and Windows devices. Better yet is to go through Authy’s setup process which begins here and visit each of the four links at the bottom of the screenshot below in succession. 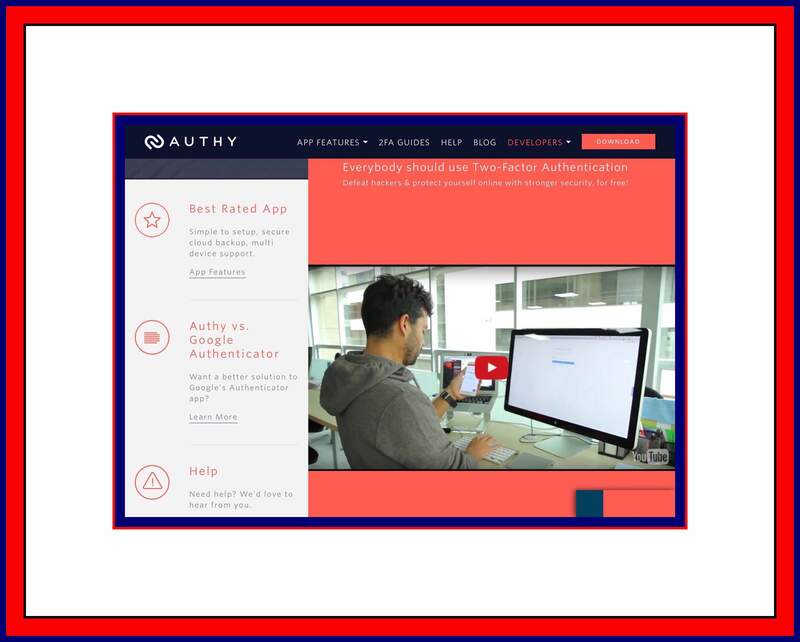 Some websites have more specific information about using Authy with their website on a special page that looks like the screenshot below, you can get to that webpage using this link. 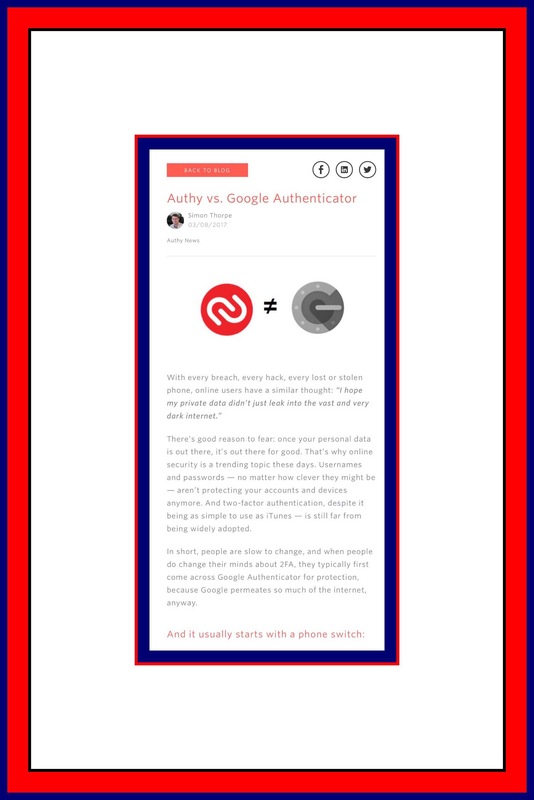 You can read more about how Authy compares to Google Authenticator here. I know some of you are thinking ‘wait…is 2Fa really all that much safer? Does it really make sense to incur additional time, aggravation and risk (yes, risk!) to employ it? It just so happens Wired Magazine had the same question. You can learn what their take on it is…what the benefits or lack there of really are in their recent article ‘Myth’s of 2 Factor Authentication’ here. Lucky for Me…Authy Works With Amazon!!! 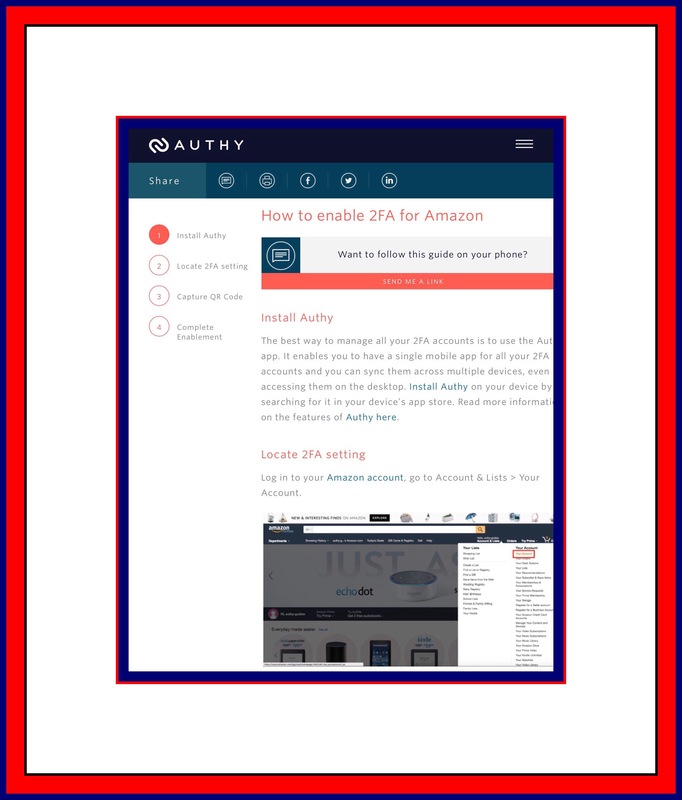 You can visit Authy’s setup instructions for Amazon here. Please leave any comments or questions here. This entry was posted in Amazon Prime, Password Security, Tech Tips and tagged 2 Factor Authentication, Amazon Echo, Amazon Prime, Authy, Multiple users of 2 Factor credentials, Password Management for Families. Bookmark the permalink.